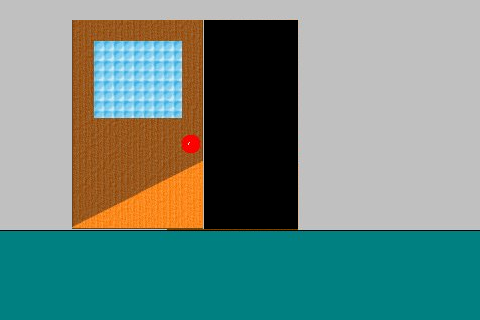 i´m a absolut beginner and try to create a test game. 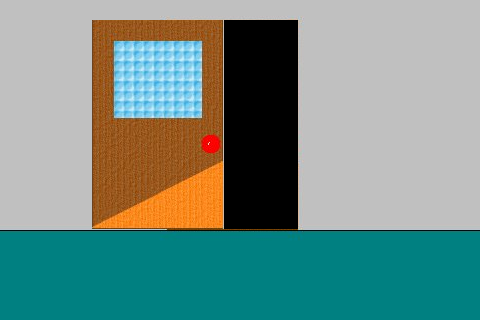 it´s like a already available door game and i like to figure out how to code it and how i have to use the canvas and sprites a.s.o. 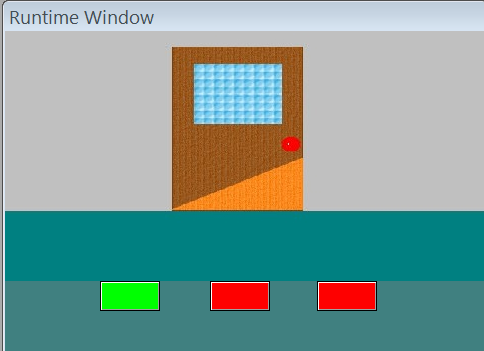 you see a canvas and 3 red buttons. you see an other canvas with the same image backround and the 1st button now has a green backround (right button pushed). 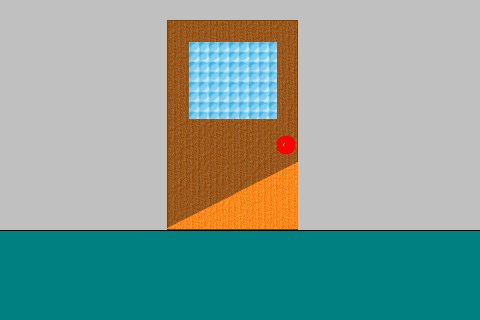 now the canvas has an other backround image with an open door and a "back" button appears which leads you to the home card again. all buttons on card 4 have a green backround image to show the buttons were clicked in the right directions. 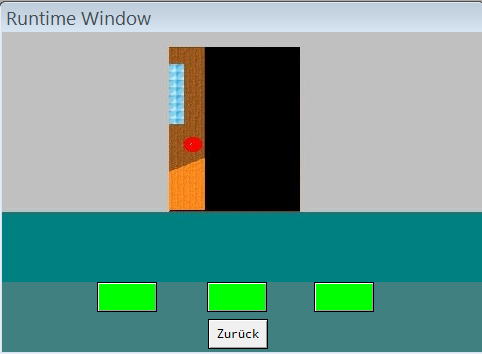 actually i´d like to insert a door opening animation, but i have no idea how to create and insert one. you see, the logic is simple but the way of "coding" is primitive. 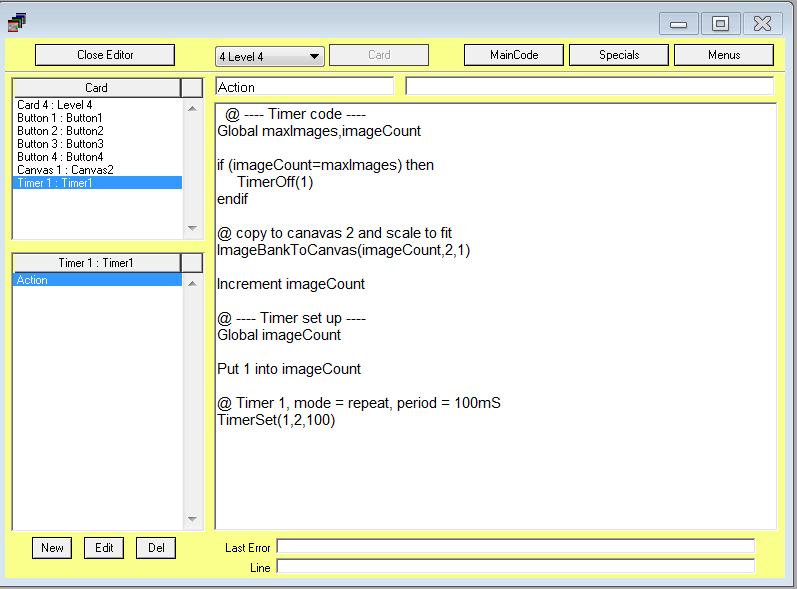 maybe you could make an example of using the HAC elements like canvas, animations, sprites a.s.o. for this game? no ideas? or maybe off topic? Your game idea and graphics really brightens up the forums - nice to see some pictures. 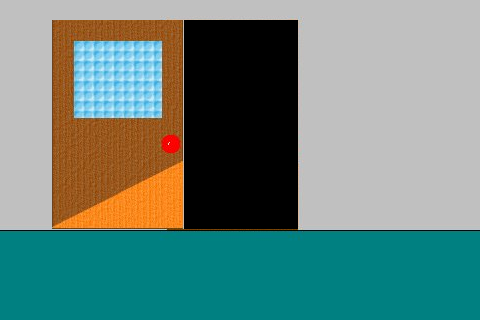 Yes you can do these with canvases and the sprite engine. For the colored buttons your canvas idea is probably the best approach. 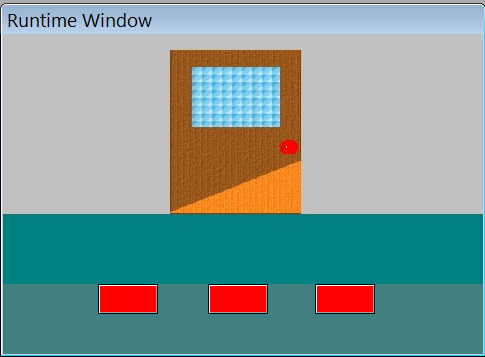 For your door animation you could either use a canvas or the sprite engine with both methods using the image banks. 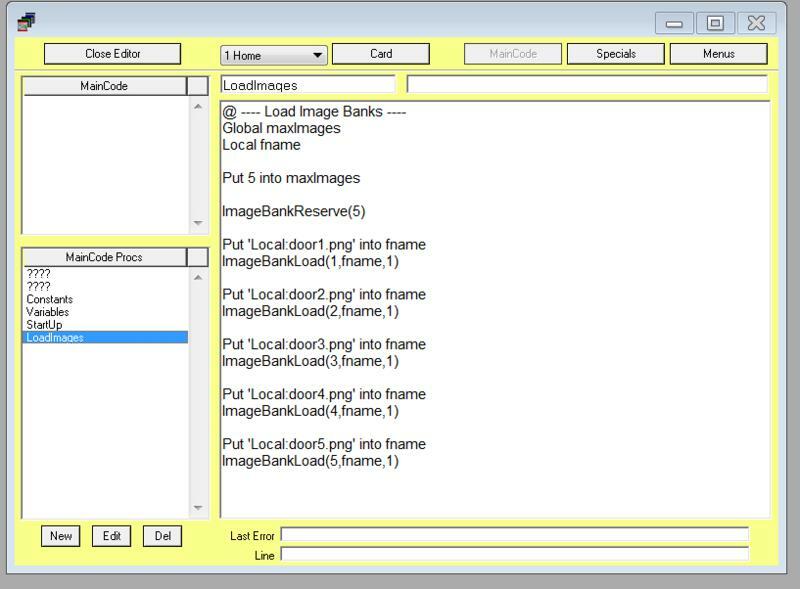 The image banks are preloaded with images before the door animation runs. Of course for canvas animation, you could just load the images from disk(sdcard) but it might not give smooth animnation although it would save memory as image banks hold their images in memory which is why they are faster. Note, usually its best to have the image banks preloaded as the game is starting up but before the Home card loads. For a canvas door animation just preload the images, then on the card holding the the animation, add a timer to cycle through the images. To preload the images make a global procedure called LoadImages and call it from the Startup section of MainCode. LoadImages has the code below. For the card with the animation, add a timer with the following code. 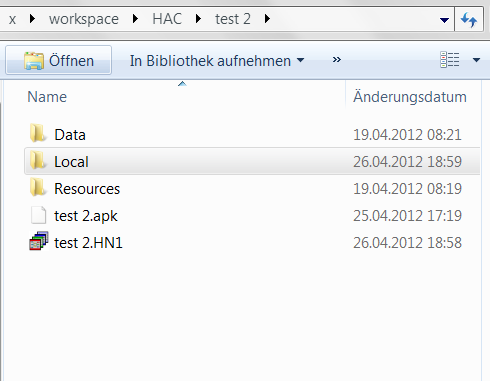 now i´ll testing around and show you my results. i called the LoadImage procedure with "Call LoadImages" in Sartup. now, at reaching the final card by pressing the buttons in the right direction, there is no animation to see, what did i wrong? 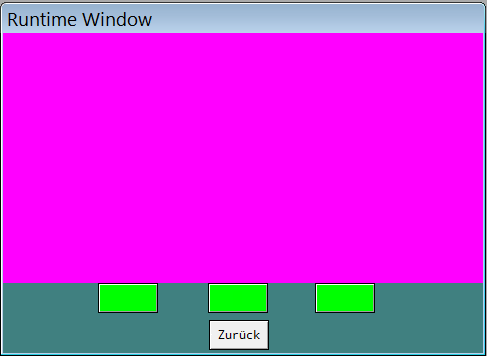 Thats looking really good and the code looks fine. Only thing that I cannot see mentioned is the code to start the timer - is it in a button or in the card? Notice i've changed the timer period to 2 seconds. 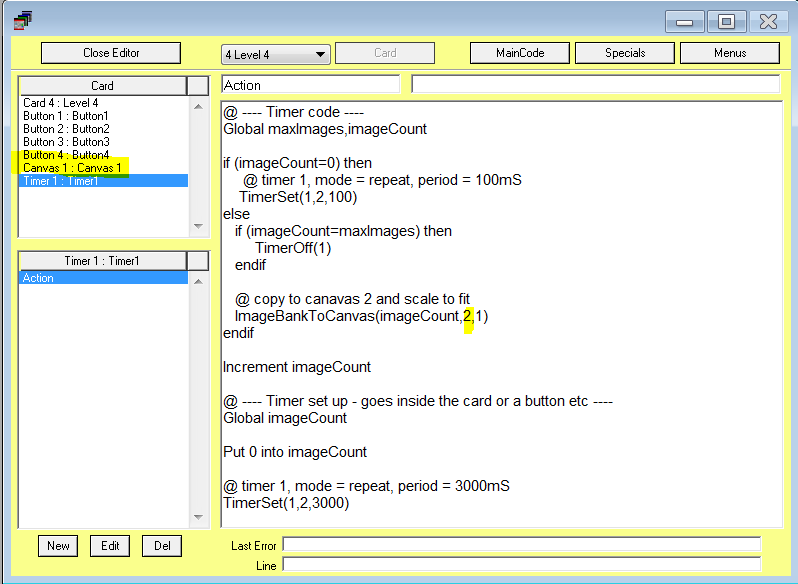 2) code to start the timer - because by default the timer is off. 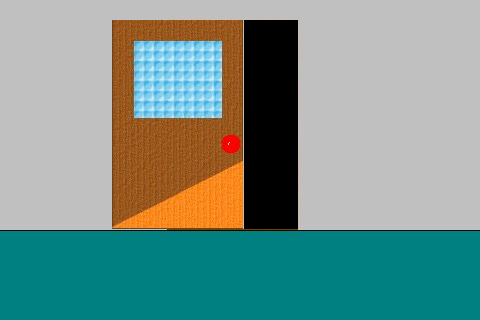 Note, if you call this from the card sscript - so that the animation starts as soon as the card is fully loaded - then with short periods the initial part of the door opening might be missed. sorry, now i know what you mean with button. 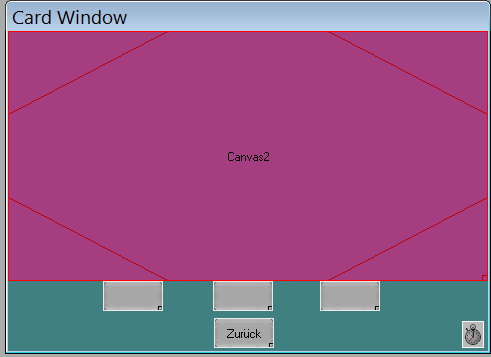 you´ve been thinking i like to use a canvas as a button to start the animation don´t you? no, i´d like to start the animation automaticly when card 4 is reached, this is why you type "canvas 2" right? So, when card 4 loads, it sets the timer to start after 3 seconds.